Y'all have a wonderful time. The "tournament" such as it is, is up for grabs. Whomever wants to try and babysit all of the egos and rules lawyers, is welcome to it. Y'all have successfully sucked all the fun out of this game. WHAT !!! just take break i once quit for year give or take a month or two. When I came back I decided to have fun with the game and not worry about all the bull crap. Edited by Rockstone_, 04 June 2017 - 01:36 AM. We've been ridiculously flexible for them and didn't deserve such treatment. We expected much more respect from WHAWK. Edited by PhoinexFire, 04 June 2017 - 01:40 AM. Classic tournament stuff. Repeat once a year. I just got a thing. 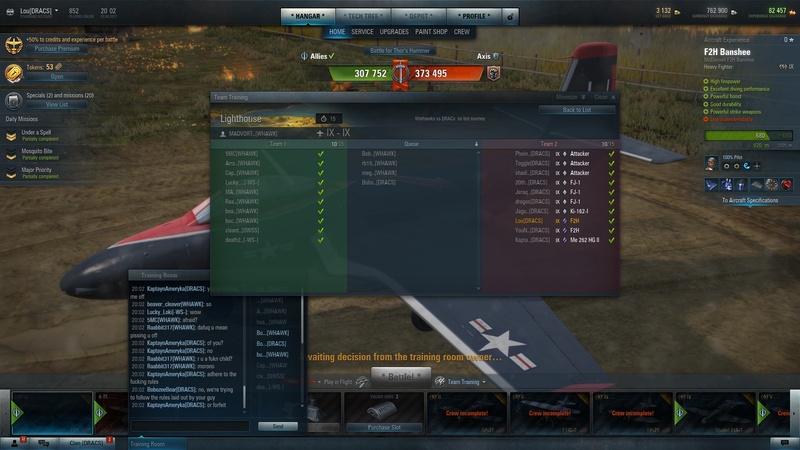 I only flew two battles in the event and didn't earn a single crate. The tier IX something or other. Just sitting in my hangar, didn't even have to buy mission completions. Edited by Ace_BOTlistic_Cosmo, 04 June 2017 - 02:32 AM. You weren't in our ts - so you have no clue what was going on. We asked to have this occur after thor's hammer - because our clan member like to participate in Wargameing events. We gave you the match yesterday - we told you this match was just to fly. We didn't dump our own - we didn't have players until the very end. As a courtesy to those who graciously helped us we were letting them fly. Warhawks went out of our way to accommodate Dracs. 2. It was YOUR way or the highway; we wanted to play by the rules. Is that too much to ask? You were obviously in a different Team Training Room than I was in. Your attitude is too much. Deal with it . The sun doesn't rise and set on you and the Dracs. ​Attitude? LOL. We like to play fair; don't know about you? 21:28 MARS_REVENANT[SICK]: is that veteran skill? 21:28 Arthur77[FALCO]: are you ready?? 21:28 chalao123[FALCO]: a you readyyy!!! 22:46 Arthur77[FALCO]: are you good like that?? 22:52 Zorro_Plateado[FALCO]: porque hay boots? 23:01 MARS_REVENANT[SICK]: THANKS FOR THE BATTLES. $#&Tpoasting here does nothing to help the matter. Everyone on all sides just needs to call it "good enough" as it stands and just go cool off. Perhaps some self analysis is in order, self delusion is a sign of serious psychological disorder. That is a bad photochop hampster. Edited by Mezurashi, 05 June 2017 - 05:52 AM. I heard from a CLOWN member, your Capt is a tyrant.